Recently, there’s been an increasing interest in the role of social norms in shaping people’s aspirations and promoting – or limiting – equitable development. We’re all aware of how we are influenced by our peers, that sometimes we do things so we are accepted by a group that’s important to us. But just how we can build on this human need to belong to promote equitable and inclusive development is hard to know, and evidence to guide such efforts is patchy. Over the past five years, Itad has been working with Nigerian colleagues brought together by Palladium, WRAPA and Social Development Direct on the DFID-supported programme Voices for Change (V4C). Working across four Nigerian States (Enugu and Lagos in the Christian south and Kaduna and Kano in the Muslim north) and using a social norms approach, V4C aimed to catalyse support amongst young women and men for greater gender equality. The programme was known for its innovative approach, promoting change simultaneously at three levels – amongst individuals, in wider society, and informal institutions such as government legislation and policy, and political structures. Young people were invited to join intensive ‘safe space’ dialogues either in person, in their colleges, or online. Transformative gender awareness training was provided for influencers in young people’s lives, such as media personalities and religious and traditional leaders, to enable them to promote positive gender behaviours. To promote societal change, and create the space for young people to adopt more equal gender behaviours, the programme ran ‘Purple’, a branded mass media campaign across radio, TV and social media, to make gender equality the new cool. Finally, to strengthen institutional commitments to gender equality, the programme supported Nigerian gender advocates to push for legislation to enshrine equal opportunities in law and prohibit the use of violence, to give greater focus to committing budget resources to promote gender equality and assisted women to get more involved in politics. So, after four years of implementation – and lots of learning along the way – what did the programme achieve? Was the programme successful in inspiring young women and men to adopt more equal gender behaviours in their own lives and encourage their peers to do the same? Throughout the programme we invested in strong monitoring and evaluation systems, including a longitudinal population representative panel survey (aka good hard quant data! ), to measure changes in young people’s gender attitudes and behaviours and shifts in social norms, and to draw out learning about what works (and what doesn’t!). During the four-year life of V4C, there was large-scale change in young people’s gender attitudes in the four states. 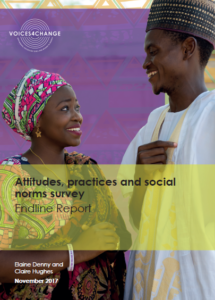 A total of 89% of Nigerian young people in the four States (2.4 million people) improved their attitudes and behaviours in at least one of three areas behavioural areas: women’s decision-making, women’s leadership and violence against women and girls. It is hard to specify exactly the contribution V4C made to these large-scale changes but there is good evidence that Purple played a major role. Almost 48% of young people in the four states (that’s 1.14 million people) recognised Purple and over 70% of them correctly identified the brand as being associated with gender equality. These ‘Purple people’ experienced greater levels of change in their gender attitudes and practices than young people who did not recognise Purple in most of the areas that we tracked. For example, ‘Purple people’ thought more about gender issues than ‘non-Purple people’, they believed more strongly that women’s opinions matter in decision-making were more supportive of women’s leaders and were more likely to speak out against violence against women and girls. Results in changing, at scale, young people’s attitudes and behaviours towards violence against women and girls were more mixed. Young people’s attitudes and practices towards violence against women and girls did improve during the life of the programme but V4C’s contribution to these changes is difficult to pick out and the results differ significantly in different states. For example, in Kaduna and Kano States, young men who recognise Purple report more negative attitudes and practices in relation to violence against women and girls but interestingly, this effect is not mirrored among young women, suggesting that Purple programming may be making men more aware of what constitutes violence and, as a result, they report a greater incidence than previously. More reassuringly, feedback from young men and women directly involved in V4C’s individual change interventions indicates they have a better understanding of different types of violence against women and girls, a deeper appreciation of gender issues generally, including VAWG, and a greater willingness and ability to take action to address violence against women and girls. We did, of course, want to know not only what V4C was achieving but also how it was making change happen. These insights were often generated through our qualitative studies, particularly a rapid study on ‘how change happens’, which complemented evidence generated through the panel survey. Through this combined evidence, we found that V4C’s intensive personal change interventions, like the safe spaces with young men and women, were successful in bringing about much higher levels of positive change in young people’s gender attitudes and behaviours, especially amongst men, than found amongst ‘non-Purple people’. But the effect of these interventions is much greater as the evidence shows they have catalysed ‘agents of change’, young people who started to role model or champion more equal gender attitudes and behaviours, diffusing them to their peers. Many of these young people have had profound effects on others, with the latter reporting high levels of attitude and behaviour change as well, sometimes even larger than the changes reported by young people directly involved in V4C personal change interventions. Strengthening the enabling environment for young women’s empowerment in Nigeria: Achievements and learning from Voices for Change, which combines evidence from a range of robust data sources, including the panel survey and a qualitative rapid study into how change happened.